Designer, Ji Won Choi’s work “revolves around human cultures” and as a well-traveled woman, she is in a good place to give her social-come-design commentary. Born in Seoul, raised in the midwest USA, and then educated in New York City and Paris, she uses design to promote positive change within societies. 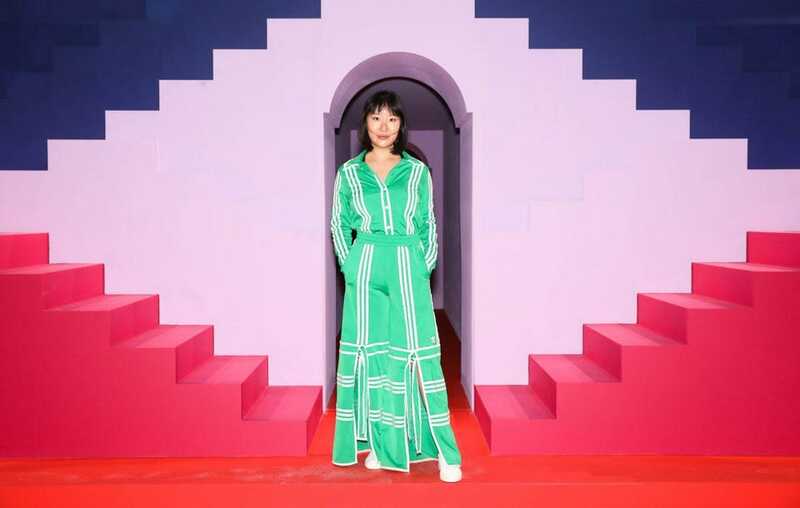 And this all struck a chord with adidas Originals as Choi is their latest creative collaborator, the third in a series of partnerships with emerging female designers who are reimagining iconic three stripes designs. 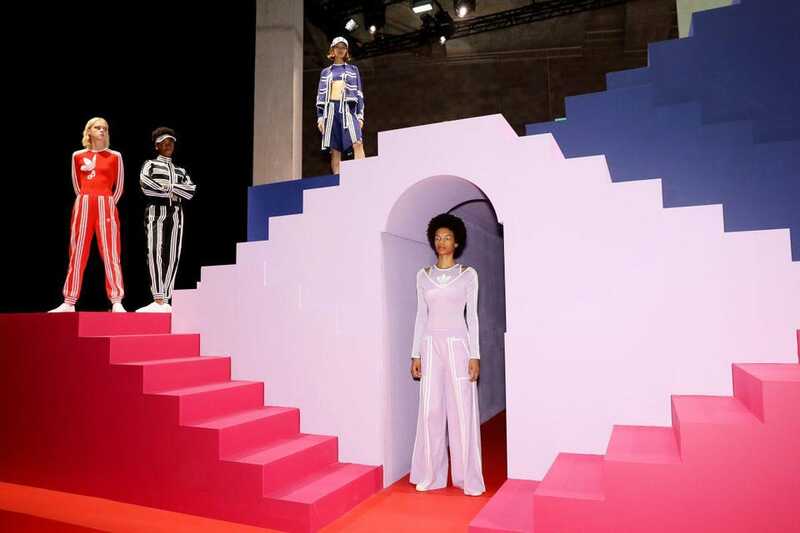 And this collection was presented during London Fashion Week. 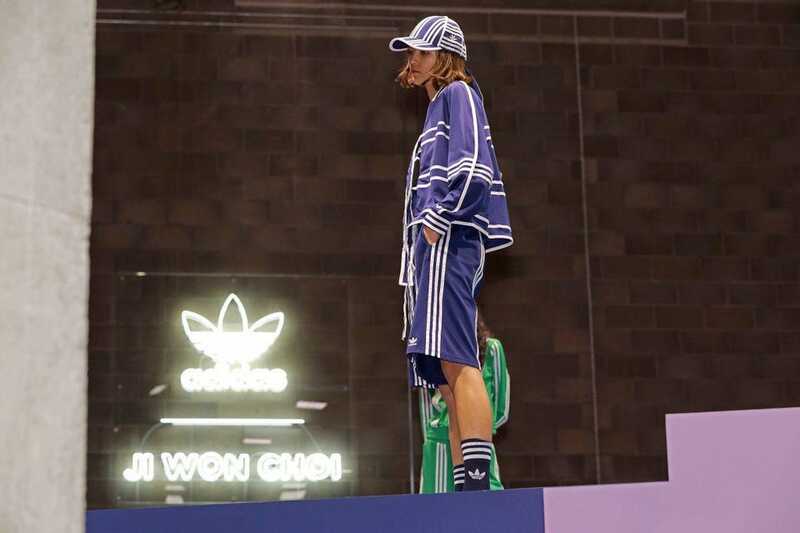 The capsule women’s ready-to-wear lines looks into the idea of movement while reimagining the famous three stripes through the lens of sport and culture. It celebrates the designer’s Korean heritage with suped-up stylistic inspiration and a healthy dose of cultural references thrown in. Choi adapted her personal design philosophy to the sportswear-inspired line to deliver a fresh take on the classic tracksuit. Ji Won Choi: The first thing I think of is how iconic the brand is, it so recognized globally; anyone and everyone knows Originals. JWC: The collection is a play on the classic Adidas tracksuit merged with my own aesthetic. The color palette is very vibrant and saturated: red, fuchsia, greens all inspired by the adicolor palette. 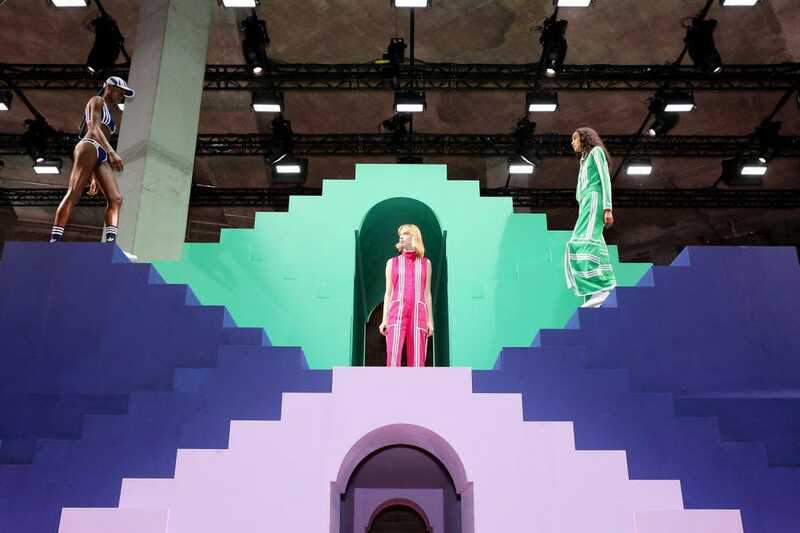 The silhouettes suggest movement, such as the addition of strap pieces to encourage the wearer to interact with the clothing. FC: What was on your mood board for this line? JWC: The Adidas tracksuits, the very classic ones and images from first the collection. I wanted to have my own work next to the tracksuit imagery to bring something familiar to the collection. FC: What fed into your designs? 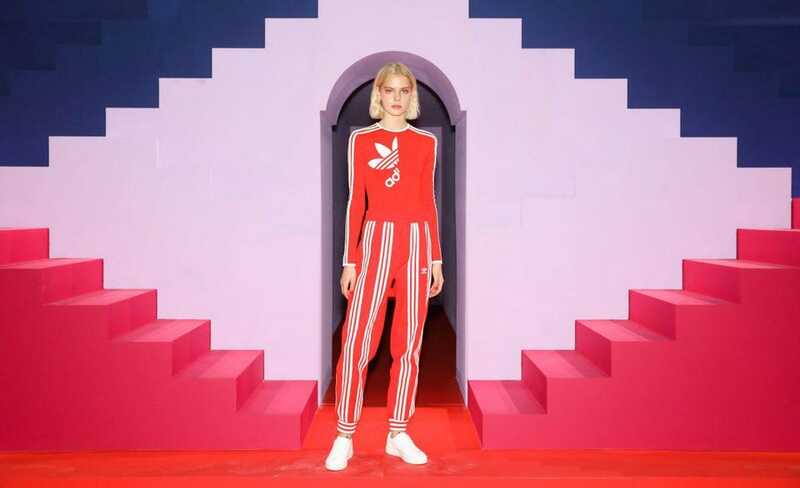 JWC: I was actually really inspired by my trip to the Adidas headquarters in Germany, everyone’s personal style was very sporty and it fed into some of my ideas for the collaboration for sure. 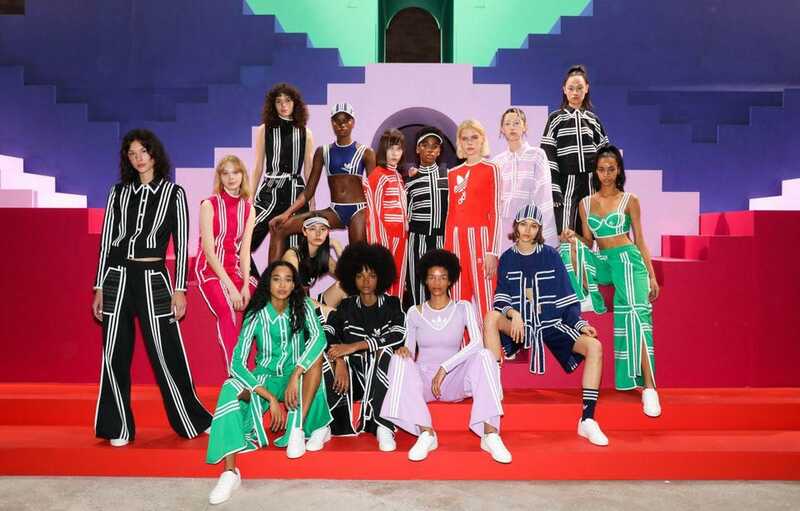 My own work is definitely very bold and more niche so being at the headquarters and working with the team to re-work something as iconic and wearable as a tracksuit really informed a new way for me to approach my work – designing for a much wider audience. FC: How have you merged both aesthetics? JWC: The sporty element of the collection is very Adidas plus the use of the iconic three stripes, and you can see my graphic visual aesthetic in the repetition of those elements and through the movement of the garments. FC: What reaction/feeling did you want to create? JWC: The feeling I wanted to create was confidence, for the wearer, but with ease. I wanted to create a loud statement through very simple clothing and visually, I wanted to create a mood around playfulness, vibrancy, and excitement. Pick up the collection exclusively at www.adidas.com and select adidas Originals flagship stores and retailers from 23 February.